If you dig deeper, you will see that by selecting one company, you are able to edit company details from the "Actions" dropdown menu, as well as to delete companies (note that this part of feature is still between testing and will be released shortly). At this point you already see that it's possible to go for 'new company' and 'import companies' from this view. 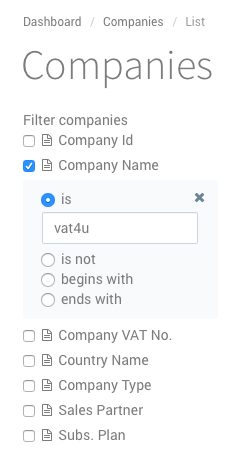 By clicking either on the company id with underlined content (2, 165 e.g) or on the last column in table called "Validation info", you will get more information and details about a selected single company. At this point, you will be able to upload company Mandate files and to check company documents which are already uploaded.